No doubt the title of the new film (500) Days of Summer (which hits theaters in mid-July) has to sound like a bit of a fantasy for all of us here in Boston, where it’s been a pretty bad summer so far weather-wise, what with the rain and cooler temperatures that have lasted into late June. The tough news to share is that this movie does not offer sunshine and warmth; it’s actually a bit of a cold shoulder. But the good news is that should the weather stay miserable, (500) Days offers a decent alternative to walking around town with an umbrella. In the film, Tom is a hopeless romantic who believes in love at first sight, destiny, and all that stuff. He even has the hopelessly cheesy job of writing greeting cards for a living. But he’s played by indie film fave Joseph Gordon-Levitt (The Lookout), so I guess that actually makes him pretty cool (or at least it’s supposed to). 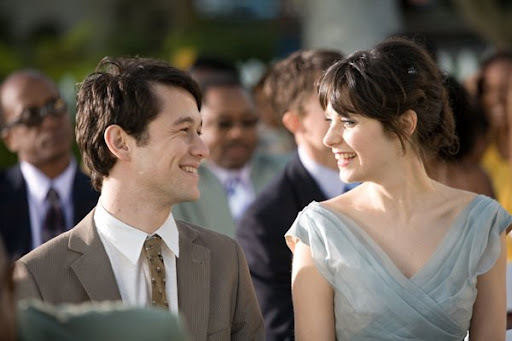 When Tom sees Summer (played by another favorite of the indie film crowd, Zooey Deschanel), he is instantly smitten. Of course he is — Summer is adorable. And despite the fact that she informs Tom that she does not believe in love and prefers to be single, he pursues her anyway. Then one day, totally out of the blue, Summer kisses Tom. And over the next year and a half, the two bond and become something resembling a couple (at least in his eyes). We see in the film’s opening scene that the two eventually break up, a development that leaves Tom devastated. Will he ever get over the girl of his dreams? Does he still believe in love and destiny? 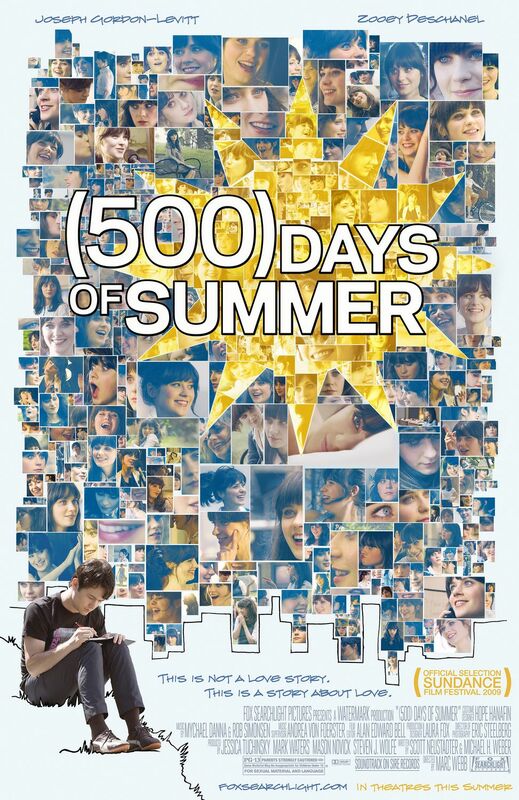 (500) Days is a romantic film for those who don’t like romantic films. It has a decidedly hipster/indie feel to it that starts with the two leads and continues through the disjointed timeline, the soundtrack (which features the Smiths, Feist, and Regina Spektor, among other folks), and the less than romantic plot trajectory. Which is not to say the film doesn’t dabble in cheese every now and then (especially in a scene the morning after the couple has done the deed, where Tom hears Hall & Oates, dances in the street with strangers, and sees cartoon birds), but it’s pretty far away from, say, He’s Just Not That Into You and films of that ilk. 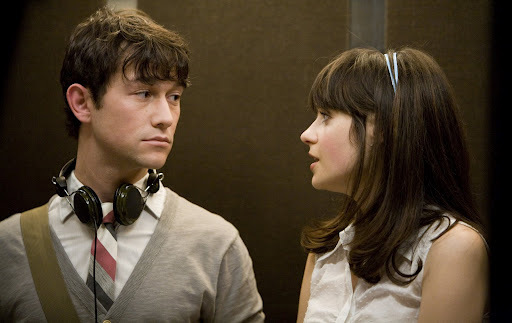 Also to the film’s credit is the fact that Gordon-Levitt and Deschanel both give winning performances and make an attractive couple. They ground the film in honest, cool reality, giving it a welcome authenticity that’s a nice change from conventional, mainstream romances. Still, (500) Days does feel a little too proud of its hipster-ness, and watching the movie, surrounded by young twentysomethings as I was, I felt like I may have been a little too old to really and truly enjoy it to the full extent. So that’s why, when the lights came up, I decided to only give the film a B — which means the film is good, but it’s not the instant classic it so wants to be.